Two moms, two husbands, five kids, and no time to cook dinner. What's on the menu? "Meatless Monday" is a catch phrase that I have been seeing a lot of lately. As a way to add variety to my meal plan, if not to eat healthier and find alternate sources of protein and fiber, I have been making an attempt at meatless meals every now and then. Typically, my ventures remain somewhat safe and include pasta, and, admittedly, I am always a bit concerned that we will miss the meat or feel unsatisfied. This pasta dish is perfectly filling and satisfying, and absolutely delicious. My kids are beginning to enjoy artichokes, and my husband (our family's prime meat-eater) raved about it the first time I made it, leading me to add it to our regular rotation. As a side note - I find that it is fine to skip the parsley, but you cannot skip the panko, which adds a lot to the flavor and texture of the dish (and is the part my kids like the best). Cook pasta in lightly salted boiling water according to package directions. Drain pasta and return to pot. Meanwhile, in a large skillet, heat 1 Tbsp oil over medium heat. Add garlic and cook for 1 minute or until fragrant but not browned. Add broth, artichoke hearts, beans, and oregano. Bring to a boil; reduce heat. Simmer, uncovered, for 5 minutes. Add artichoke mixture to pasta in pot. Stir in tomatoes and salt. Cover and keep warm. Wipe out skillet. Heat remaining 1 Tbsp oil in skillet over medium-high heat. Add panko crumbs and cook, stirring frequently, for 3 minutes or until toasted. Divide pasta mixture among serving plates; top with panko and parsley. My coworkers strike again! We love to eat-birthdays, meetings, holidays, retirements, going away parties. I cut into this dish while it was still hot; it was amazing (more amazing was how my friend served it hot despite her two small children needing lots of her attention during the pre-work marathon). I took a bite and immediately asked for the recipe; within seconds the cook produced it and made me a copy. I often make dishes like this the night before a holiday...just throw it in the oven and it's ready. In a large skillet, prepare hash browns according to package directions. Sprinkle with garlic salt and pepper. Transfer to a greased 2 1/2 quart baking dish. Set aside 1/2 cup of bacon; sprinkle remaining bacon over soup. In skillet, scramble eggs in butter until nearly set. Spoon over bacon. Sprinkle with cheese and reserved bacon. Bake at 350 degrees Fahrenheit for 20-25 minutes. Since starting this blog, I have tried many, many new recipes. Some of them have made it to these pages after having been tried several times and passing the tests of a husband, six-year-old, and four-year-old (and me, of course). But yet, there are still some recipes that I reach for that I grew up with, ones that take me back to my mom's kitchen. This is one of those recipes. In fact, this was served at my wedding shower. Simple and flavorful, you can't go wrong with chicken piccata. Marinate chicken, sliced or pounded thin, for 45 minutes in egg/lemon juice (1 tsp) mixture. Combine flour and seasonings. Dip chicken in flour mixture. Melt 1/2 stick of butter and fry chicken until golden brown. Add bullion cubes to 1 cup of boiling water and 2 tsp lemon juice. Add to skillet with chicken; simmer 20 minutes. I like to pretend I have it all together, but some weeks things just don't go your way. Honestly, I think I am recovering from a non-stop series of days. Last week was crazy with four track meets, a half marathon, a garage sale, and beautiful weather. The number of 4 AM wake-ups have taken their toll, and I only cooked once this week. I regretted signing up to donate a dessert to the Teacher Appreciation Luncheon that is tomorrow. It can be hard to find a way to volunteer at your child's school; this seemed easy, and I love to make desserts. Exhausted and commuting home, I started planning which bakery I'd be hitting up for some goodies to pass off as my own. Then, I remembered making this Gooseberry Patch dessert for my dad. All of the ingredients were easily in my house; no need to stop at the store. The brownies were so good that my family asked me if I made them from scratch (no one has EVER asked me that). The finished product looks great. So, right now my oven is preheating to 350. I love the easy "Blue-Ribbon Desserts" in 101 Farmhouse Favorites. Since I am going to be fully back in the swing of things after a promised restful Mother's Day, I started my shopping list and meal plan; I'll definitely be making the "Luscious Angel Cupcakes". My husband is hopeful that I'll can make the "Amish Hot Pepper Rings" for him. The photographs in 101 Farmhouse Favorites are what sold me on many of the recipes I tried. Also, I liked the easy organization of the cookbook; the sections are color-coded on the edge of the page so you can flip through it quickly. 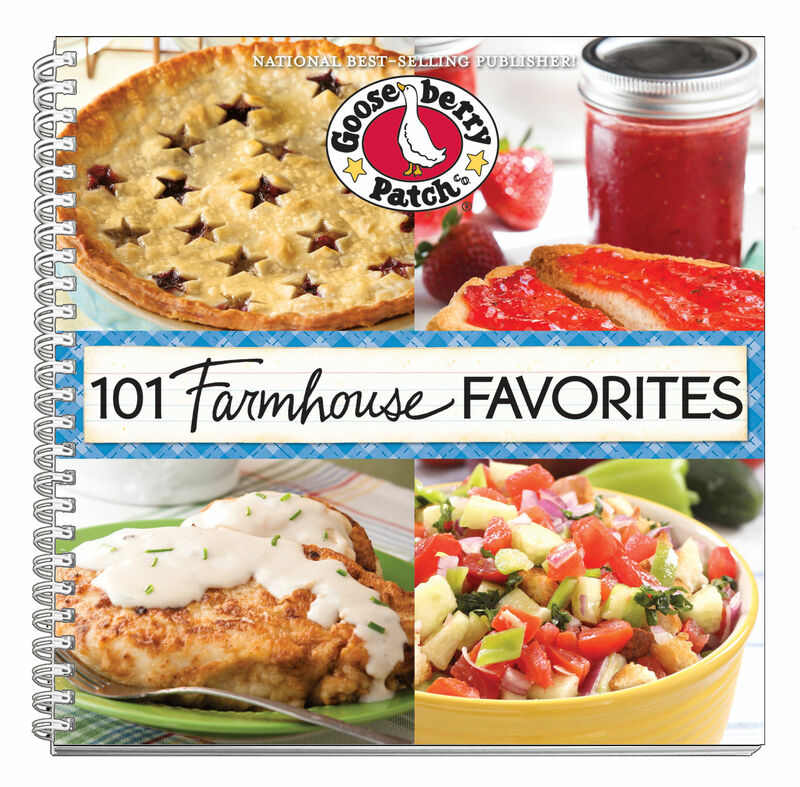 We are sorry, but our giveaway of 101 FARMHOUSE FAVORITES has ended. In a large bowl, mix together dry brownie mix, one cup of pie filling, oil, and eggs. Pour into greased 13 x 9 baking pan. Bake at 350 degrees for 30 to 35 minutes, until firm. Sprinkle hot brownies with chocolate chips; spread chips with a knife when melted. Let cool; cut into squares. Top with a scoop of ice cream and some of remaining pie filling. Spring is finally here! And so is our next Gooseberry Giveaway!! We are thrilled to have the opportunity to review a new cookbook by Gooseberry, and - even better - to have one to give to one of you! 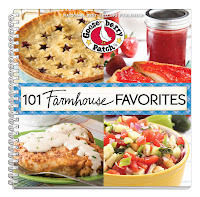 101 Farmhouse Favorites is a fantastic, full-color cookbook from Gooseberry's photo series. I always love the opportunity to see an image of the final product before I attempt a new recipe, so I really appreciate the color photograph of each of the delicious looking recipes in the book. 101 Farmhouse Favorites is filled with great ideas for breakfast, lunch, dinner, and dessert, and even has an entire section called "Classic Country Canning," with recipes and instructions for even the most novice of canners (like me). The salsa, pesto, and spaghetti sauce are on my "must-try" list from that chapter. But as I dove into the book for the first time, the "Garden-fresh Soups and Salads" chapter is what really caught my eye. From "Mommy's Pasta Fagioli" to "Best-Ever Spinach Salad," I couldn't decide where to begin! In the end, I decided I had to share this delicious salad. There is just something about an easy, homemade dressing, and this one is superb! I also love having a great use for the rotisserie chicken leftovers that I tend to have. Flavorful, refreshing, hearty, and crisp, this is a salad that I will make again and again. WE ARE SORRY BUT OUR GIVEAWAY OF 101 FARMHOUSE FAVORITES HAS ENDED. In a large salad bowl, toss together all salad ingredients. In a small bowl, whisk together all vinaigrette ingredients. Drizzle dressing over salad, tossing gently to coat. The plan is to go grocery shopping after work today, so last night as I was making my list, I threw together this meal plan. The past few weeks have been a little odd for my family, with me being gone on a trip and my son getting his tonsils out and being on a soft diet. We are finally ready to get everything back to normal! These "meat cupcakes" as my son calls them are always a huge hit with my kids; I need something that will meet no resistance after dragging the kids grocery shopping on the way home from school and work. With the weather as nice as it has been, I have been wanting to spend more time outside and away from the kitchen. Coming home to this slow cooker meal will be great on a Friday. I will gladly bring a salad to accompany the pizza, but no cooking for me this day! Happy Cinco de Mayo! I am bringing out an old favorite for dinner. My husband just bought a new grill; I know I can count on him to cook our favorite pork chops to perfection. All I will have to do is make the marinade. I will serve them with rice, seaweed sheets, and some fresh veggies. My kids can't get enough of the seaweed sheets. Fortunately, they now carry them at Costco! Another meal for my husband to grill while we play on the swing set. We all love the Dill Sauce for dipping our salmon. My husband will be late getting home. Another perfect day to not have dinner waiting for us when the kids and I get home. I just have to remember to do a bit of prep work Tuesday night! Follow by Email to get new recipes delivered to your inbox! ©2010-2014 The Busy Moms' Recipe Box. Travel theme. Theme images by linearcurves. Powered by Blogger.